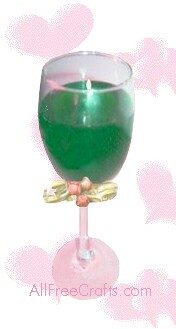 These gel candles are fairly simple to make, but look very romantic on the dinner table or sideboard. You can use champagne glasses or shot glasses, if you like, or even old-fashioned ice cream sundae glasses. Don’t use glasses that are very thin; thicker, dollar-store style glasses withstand the hot gel better, with less chance of cracking from the heat. Silk roses or dry miniature rosebuds look elegant tied to the top of the stem with small lengths of raffia or lustrous, gold ribbon. Small wine charms are also appropriate, particularly if they match the occasion that you are celebrating. 1. Pour water into your glass, until the glass is nearly full. Pour the water from the glass into a measuring cup and note the measurement: this is how much wax you will need for the gel candle. 2. Wash and dry the glass thoroughly, then polish with rubbing alcohol and a lint-free cloth to remove all traces of grease or fingerprints. 3. Tie the pencil or small dowel to the pre-tabbed wick, so that the tab can sit in the bottom of the glass and the pencil can hold the wick taut and straight when balanced across the top of the glass. 4. Melt a little wax into the bottom center of the glass and quickly push the tabbed wick into place. The wax should cool quickly. At this point, the wick should be positioned correctly, held in the center of the glass by the cooled puddle of wax on the bottom and the pencil on the top. 6. Add dye or scent, if using, and stir to combine thoroughly. 7. Pour the liquid gel wax into your glass, tilting the glass a little as you pour to reduce the bubble formation, then bringing the glass upright as you near the top. 8. Once the candle is dry, snip the wick to a ¼ inch length. Use a hair dryer to warm the top and leave a smooth finish. Add silk or dried flowers, wine charms or other embellishments. Enjoy!